Democrat Malcolm Kenyatta won the primary for a state House seat in North Philadelphia. Kenyatta, who is gay, was targeted by homophobic fliers on Tuesday. To be involved in politics in this town, you need an iron stomach. 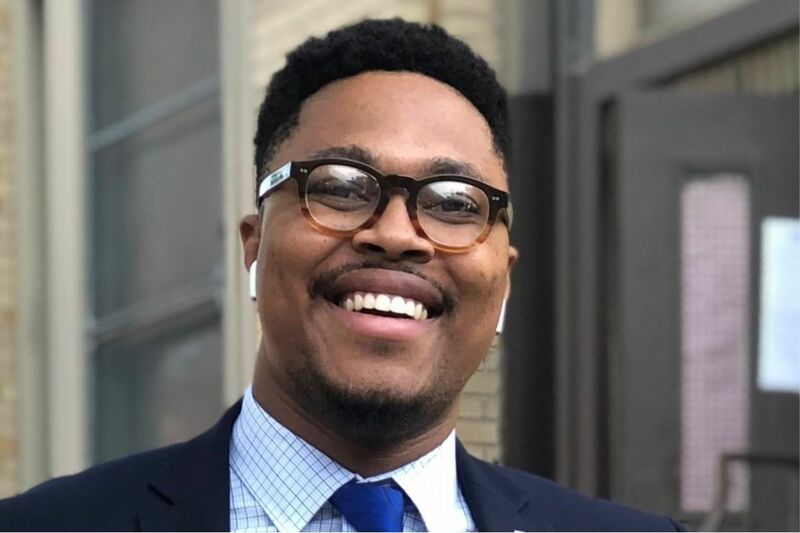 Just look at what happened to Malcolm Kenyatta, a 27-year-old who had the gall to run for public office for the first time this year. In the wee hours of the morning on election day, his campaign workers affixed door hangers in North Philadelphia encouraging voters to cast a ballot for him for the state House. That's when they spotted the homophobic fliers. "They were everywhere," he said. On cars, on doorsteps. Asked for comment, Kenyatta said voters "chose vision over vicious politics" on Primary Day. He defeated four other Democratic candidates to capture his party's nomination for the 181st District. In this Stalinist one-party city, that is tantamount to being elected. "There are big issues to address: poverty, schools, and housing," Kenyatta said. "People have no patience for the bigoted political games, and our resounding victory on Tuesday makes that clear." He declined to speculate about who might be behind the fliers. Whoever they are, the joke's on them. If Kenyatta goes to Harrisburg, he'll make history: He'd be the first out person of color in the state House. That wasn't the only shenanigan on Primary Day. This is Philly, after all. Campaign workers for Democrat Michele Lawrence, a former area president for Wells Fargo, passed out sample ballots Tuesday. "Official Democratic Ballot," they read, listing Lawrence's and Gov. Tom Wolf's names. There was just one problem: Lawrence wasn't endorsed by the city's Democratic Party. Her opponent U.S. Rep. Brendan Boyle, who won Tuesday's Second District primary, had received the party's support. Philly Common Pleas Court Judge M. Teresa Sarmina ordered the Sheriff's Office to yank the ballots from the streets. The ballots "purport to be an 'Official Democratic Ballot' but are in fact unauthorized," the ruling read. Dan Gross, a spokesman for the Lawrence campaign, said that "these sample ballots made up a small portion of the Michele for Congress Election Day outreach." He added, "The campaign immediately complied with the order and ceased distribution of the literature in question." Clout will let the judge have the last line here. "Said ballots have been located at the following Wards and Divisions," her ruling said. "Wards 41 (all divisions) and 65 (multiple divisions); Ward 5 Divisions 15 and 17, Ward 18 Divisions 3, 10 and 13; Ward 31 Divisions 3, 10 and 13." Remember back in 2016, when Councilman Al Taubenberger defended the fact that Philadelphia Parking Authority executive director Vince Fenerty got to keep his job after an investigator found he sexually harassed a coworker? "A high-school puppy-love situation" is how Taubenberger described Fenerty's advances. "Can it be interpreted as harassment?" Taubenberger, a PPA board member, said at the time. "Absolutely, because she felt uncomfortable. She brought it to the proper authorities, but always saying very clearly — very, very, very clearly — 'All I want is this to end. I want to work with the people I work with.' And that included Fenerty." In the "Year of the Woman," Taubenberger's comment came back to bite him. Several pink signs, which read "Puppy Love," popped up outside Taubenberger's polling place in Northeast Philly on Primary Day. Frank Keel, a spokesman for Taubenberger, said the signs were taken down before the polls opened. "The perpetrator needs to re-read 'A Dummy's Guide to Dirty Political Tricks,' " said Keel. Taubenberger, a Republican, later said his comment was "wrong and regrettable." Fenerty was ousted from his job. And almost two years later, eight female candidates in Pennsylvania won their party's nominations for Congress, virtually guaranteeing that women will break into the state's all-male delegation.